Pondering the origins of the Batman universe’s Joker has proven to be a fruitful pastime, one that changes and evolves depending on which version of the character you’re exploring. There are a few stories out there—Alan Moore and Brian Bolland’s The Killing Joke, for example, or Tim Burton’s Batman—as well as a partial origin tale that just unfolded in Telltale’s recent Batman: The Enemy Within game. And then there’s Todd Phillips’ Martin Scorsese-produced origin story for the character that’s currently in development. 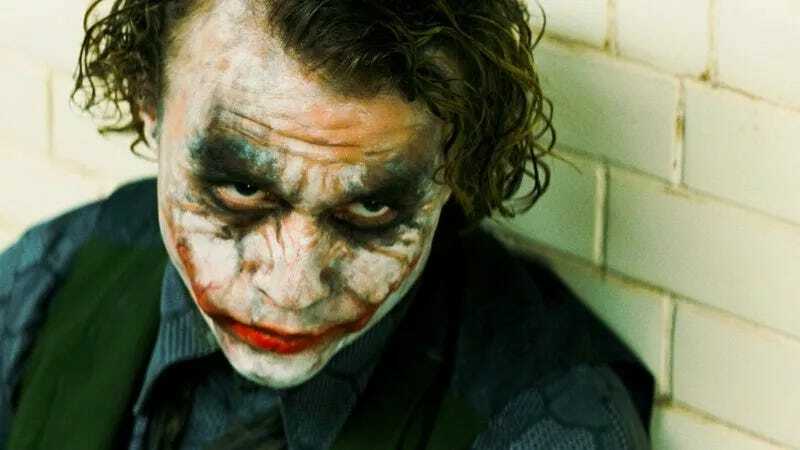 No matter how many origins emerge, however, we’ll forever be left to ponder the past of Heath Ledger’s take on the character in Christopher Nolan’s seminal The Dark Knight, a film that acknowledged the character’s nebulous backstory by having the character continually blur the truth by cycling through a number of manufactured origins. Now, Patton Oswalt, an astute scholar of pop culture, has a new take on the character. Fans have long speculated that Ledger’s Joker is ex-military, but, in an evidence-laden Facebook post, Oswalt ponders whether he’s actually ex-military intelligence, with a specialty in interrogation. He seems to be very good at the kind of mind-fuckery that sustained, professional interrogation requires. His boast about how “I know the squealers” when he sees one. The way he adjusts his personality and methods depending on who he’s talking to, and knowing EXACTLY the reaction he’ll get: mocking Gamble’s manhood; invoking terror to Brian, the “false” Batman; teasing the policeman’s sense of loyalty to his fallen, fellow cops; digging into Gordon’s isolation; appealing to Harvey Dent’s hunger for “fairness.” He even conducts a “reverse interrogation” with Batman when he’s in the box at the police station—wanting to see how “far” Batman will go, trying to make him break his “one rule.” He constantly changes his backstory (and thus who he is). To Gamble and his henchmen, he’s an abused child (figuring that they were also the products of abuse and neglect). To Rachel, he’s a man mourning a tragic love—something she’s also wrestling with. There’s some good back-and-forth happening in the post’s comments as well, and Oswalt’s been updating the post with insight gleaned from his fellow theorists, as well as new revelations he’s stumbled upon, including allusions to Abu Ghraib. One fan, for example, points out the ways in which The Joker “directs” the Batman interrogation: “Never start with the head, the victim gets all fuzzy,” Joker says. It’s neat stuff.